At least 82 people were killed in Somalia’s capital Mogadishu when a suicide truck bomb exploded outside a compound housing several government ministries. The attack, one of the most devastating in the city to date, was claimed by the Islamist militant group al-Shabaab, amid reports that a second vehicle failed to detonate. It came just two months after the al-Qaeda-linked group announced its withdrawal from Mogadishu, following an offensive by government troops and African Union forces to retake the city as famine spread throughout the country. The bomber detonated a truckload of explosives at a security checkpoint outside a compound housing four ministries, including the Ministries of Education and External Relations. A second truck laden with explosives failed to go off and its current whereabouts is still being determined, Lieutenant Colonel Paddy Ankunda, a spokesman for the African Union peacekeeping force AMISOM, told The Daily Telegraph. Last night, Ali Muse, the head of Mogadishu’s ambulance services, told The Daily Telegraph that the death toll had reached 82. Blackened bodies lay strewn across the streets at the heart of the government district in the K4 (Kilometre Four) area of the capital. According to a government statement, many of the dead were students and parents who were waiting at the Ministry of Education for the results of scholarships to go and study in Turkey. The Daily Telegraph counted more than 35 bodies at the blast site, including those of students, government soldiers and civilians. Unconfirmed reports suggest that an unidentified minister was severely injured in the blast. Many people were trapped in the rubble after buildings collapsed; an AMISOM rescue team was working to bring out survivors. Scores of wounded were transferred to Mogadishu’s two main hospitals, Banadir and Medina. The explosion’s force reportedly left houses over 1,640ft away from the epicentre of the blast badly damaged. Sheikh Ali Mohamed Rage, a spokesman for al-Shabaab, told the BBC that the group had carried out the attack, a claim repeated on a website that it regularly uses. A spokesman later warned civilians to stay away from government buildings and military bases because they were planning more attacks. Despite the insurgents’ withdrawal from Mogadishu, security officials in the capital were expecting an upsurge in guerrilla attacks as al-Shabaab shifted its tactics. Rashid Abid, Somalia Analyst for the conflict prevention and resolution think-tank International Crisis Group, said: “This bombing is significant because it comes after al-Shabaab have pulled out of Mogadishu. The attack â€“ which has been strongly condemned by the United Nations â€“ is also likely to complicate the delivery of humanitarian assistance to famine victims in the capital and surrounding areas. Al-Shabaab’s August withdrawal from Mogadishu â€“ and an apparent willingness to allow aid into al-Shabaab-controlled areas â€“ saw many international agencies return to Mogadishu after an absence due to security concerns. But an attack of this scale will prompt many agencies to reconsider. “This is bad news for humanitarian operations. Many agencies were planning to relocate to Mogadishu, but this attack will inhibit their ability to supply those affected,” added Abdi. In early September the United Nations warned that â€“ without urgent help â€“ 750,000 people were at risk of death from starvation in Somalia before the end of the year. 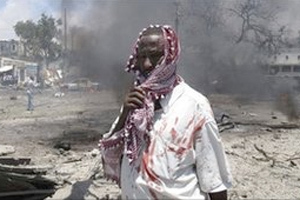 Al-Shabaab launched its insurgency against the western-backed Transitional Federal Government in late 2006, claiming affiliation with al-Qaeda â€“ which often uses car bombs â€“ in 2007. The organisation is believed to include foreign fighters who fought in Afghanistan and Iraq and have helped to train Somali militants in tactics like suicide bombing and targeted assassinations. Suicide bombings have become increasingly frequent, including beyond Somalia’s borders. In July 2010, Al-Shabaab carried out a twin suicide bombing in Uganda that killed 76 people watching the Word Cup Final in bars in the capital Kampala. In 2009, a suicide bomber killed 24 people â€“ including three government ministers â€“ at a graduation ceremony in Mogadishu.